Is This An Example Of An Insect Using A Tool? Every so often on the various nature programs we see examples of mammals and birds using tools to gain an advantage, usually having to to do with food. This is an example of an insect using a "tool", in a sense, to amplify and/or direct its courtship song. 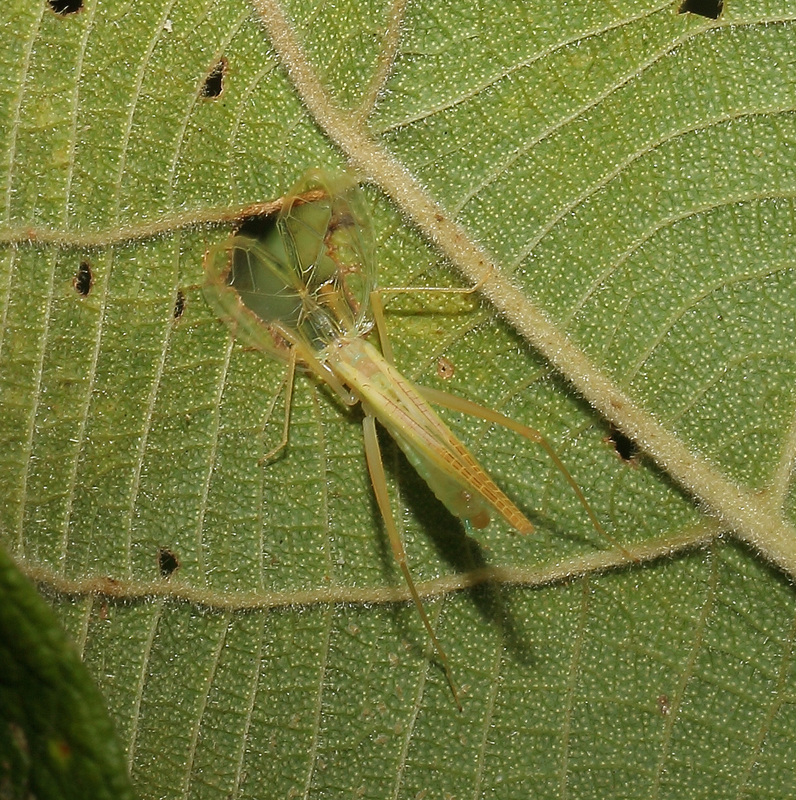 Quite often I discover male tree crickets of the genus Xabea with their heads stuck through the hole of a leaf. See another observation. Xabea atalaia elderra Otte & Alexander male with its head protruding through the hole in a leaf. Close-up of the same cricket. This activity is not unusual in the Tree Cricket subfamily, Oecanthinae. 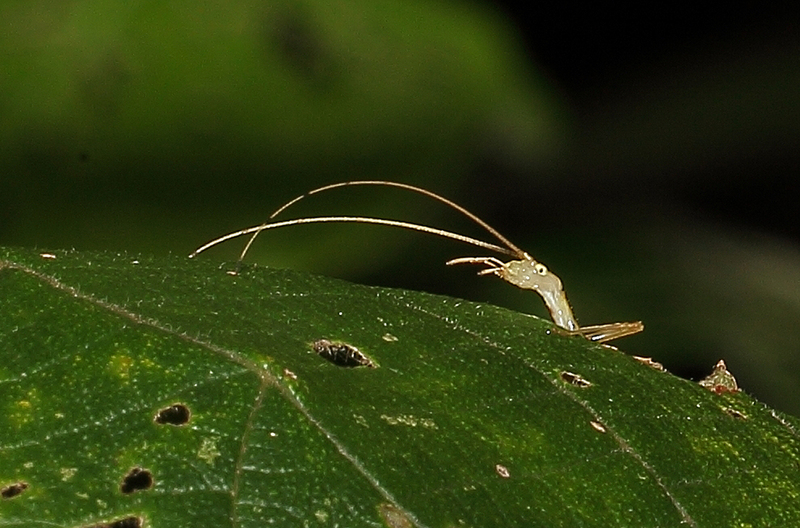 Species in genera such as Oecanthus and Neoxabea have been observed performing a similar behaviour. 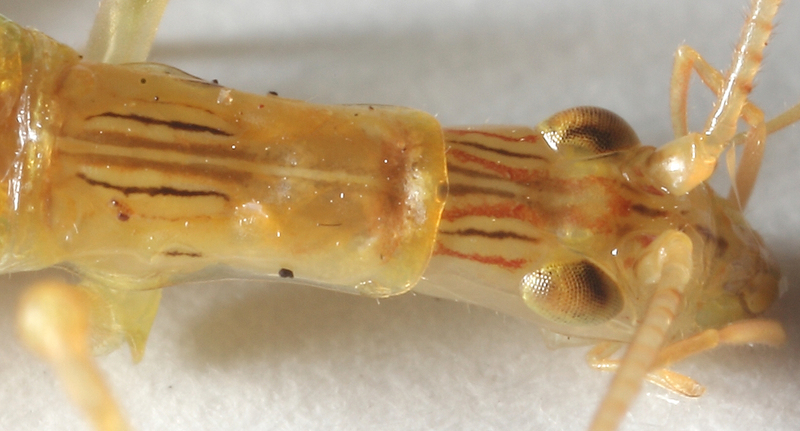 The heads and thoraxes of these crickets seem to be modified for this behaviour in that they are unusually elongated. Elongated head and pronotum of male X. a. elderra. There has been some question as to whether the cricket makes the hole in the leaf or uses or modifies holes that are already there. 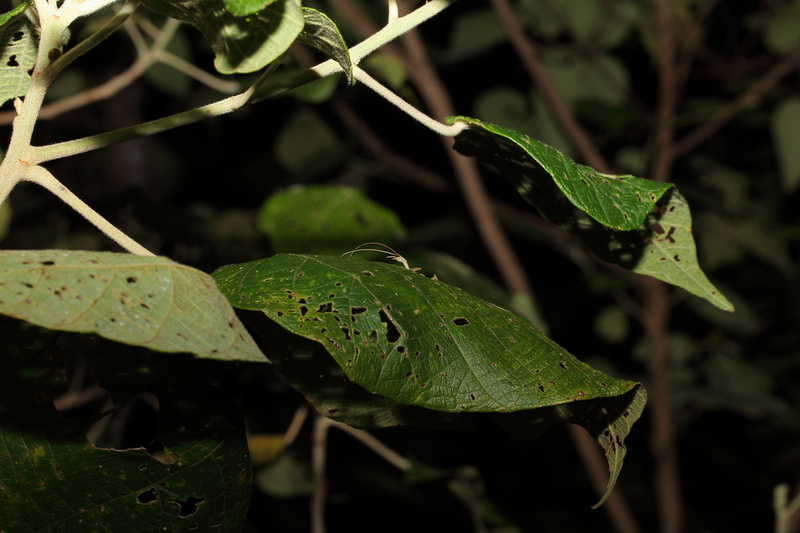 In this example made at the James Cook University Daintree Rainforest facility, the holes were ready-made by some other insect. What is the reason for such behaviour? 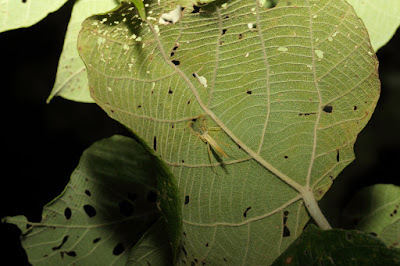 The cricket utilises the concave underside of the leaf to amplify and/or direct its song. I have made a half dozen observations of this species and this behaviour and in every case, the cricket always sticks its head from the underside of the leaf. It does not make a mistake and approach the leaf from the top-side. So what clues does it use to avoid the mistake? This species is associated with rainforest trees and shrubs and is not found in grasslands like Oecanthus species. The crickets seem to aggregate, perhaps in association with suitable leaves. As an aside, captive males did not sing in jars where leaves were not provided. Otte, D., Alexander. R.D. 1983. The Australian Crickets. Monograph 22. the Academy of Natural Sciences of Philadelphia. Pp. 1-477.